Tremsch & Metzler are a phenomenon. Pretty much on their own in Halle and perfectionists by nature, the duo has developed a very special kind of groove connected with a radical non conformist attitude. Their dry humour we know only from the northern cities in England, plays from Harold Pinter and music from early Warp artist such as Sweet Exorcist. But we are sure all of that is totally unknown territory for them and does not interest them in any way. Originally releasing under the name of Doppelschicht on MBF their first vinyl 12" carries their new name: Tremsch & Metzler. In their two years of existence they have done unbelievable good remixes which shoot into the Beatport Shop 100 sale charts on position 30, only to name their legendary remix for Butch "Muskatnuss" and "Fire" and recently their remixes for Piemont and Riley Reinhold. Their EP is out in August called "20 Toes" and highlights three of their best tracks done so far. 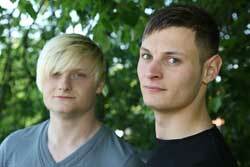 Tremsch & Metlzer are Martin Maier & Daniel Fuchs and they like to rock the crowd when they get a chance.